Yes, running local 5ks are awesome but have you ever wondered how to organize one yourself? 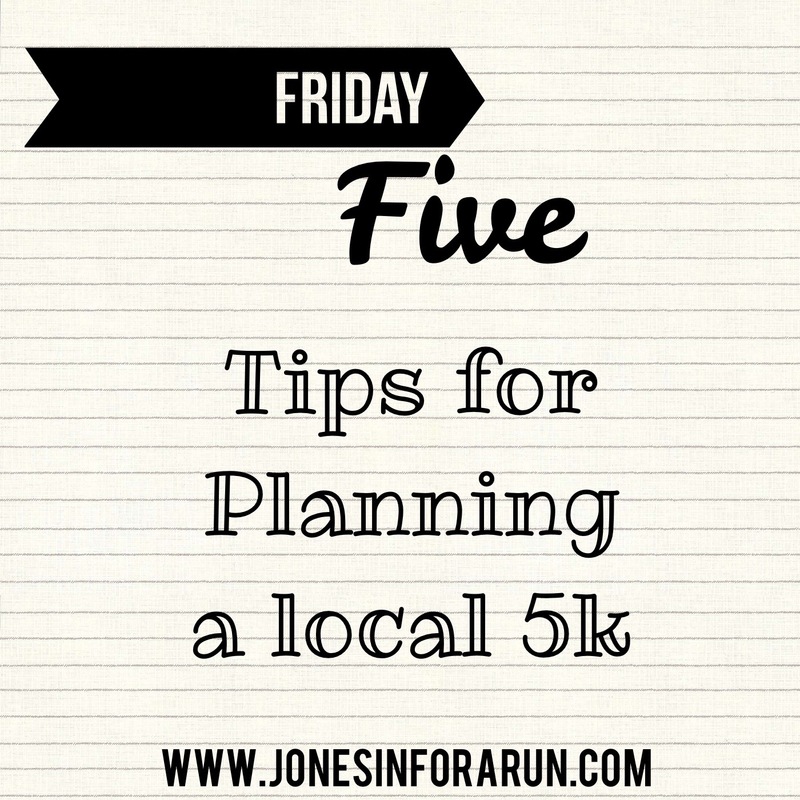 I’m linking up with Courtney, Cynthia and Mar to for the Friday Five to share five tips for planning a local 5k! Tomorrow marks my 3rd year organizing a 5k event to benefit our local ALS clinic. The race idea started with my neighbor who’s father was diagnosed with ALS. Without hesitation I went into planning mode and here we are in year 3 of the event. Partnering or using a race company is ultimately the easiest route to take- but this can also be costly. The event I planned had the goal of donating as much money as possible so we took the cheap route so please keep that in mind as you start your planning. So here is some basic information to help get your 5k event on the ground and running! 1. Get permission from everyone. Be sure to ask anyone and everyone that will be involved for permission before you make any plans. My first year we ran on roads through my town so we needed permission from the town, police and state since some roads would be closed. Before you just go and ask if you can do it, have a plan with proposed dates and a timeline. I also came with possible courses with specific request for which roads would need to be closed. Having all this work done made things a lot easier once I got the Yes from all the important people. 2. Use your resources and ask everyone for help. When I started planning the race I knew I would need help. I reached out to the local school to see if they had any groups that would want to help and sure enough the National Junior honor Society needed an event to do. I asked my moms church if they wanted to help and they took care of the water stop. Live in a neighborhood with a Boy Scout leader? Yep asked them too. No one was off limits! The cool thing is that people naturally want to help- they often just want to be told what to do. If you are planning a race reach out to everyone! The worst thing that can happen is say no – so don’t hold back! Road ID offers race sponsorships which provides free bibs and other race necessities. Be sure to check them out! Also look into using a local shirt printer who may love the extra business! 3. Make it unique. Since we skipped having a race company help us, we have forgone the official time results. What we do have is an awesome finishers raffle. Again I asked everyone I knew if they wanted to donate and sure enough, each year we have been given over 20 prizes for our runners to possibly win. Local businesses go all out and donate gift cards, golf packages and hotel stays for the runners to buy raffle tickets to try and win. It is a fun and different element that most races do not have! We do borrow our school’s cross country clock so the runners can see their time as they cross the finish line and offer a prize for the first male and female runners but our focus stays on the finisher’s raffle. 4. Promote like crazy. Social media can be your best friend here. Create an event, invite everyone and keep them updated often. I usually post updates with out newest sponsors or something exciting like our shirt design. I also created a discount code to help boost registrations. Along with social media you also need to reach out to all local media sources. Each year we have had an article in our local paper promoting the race, along with any local event website have our race listed. Word of mouth will get people you know to sign up but you also need to reach those you don’t know. 5. Pick a cause that is important to you. The best way to make the race a success is to put your heart and soul into it. If you pick a cause you feel 100% passionate about there is no way it won’t be great. ALS hit home for me as I watched my neighbor and his family each day battle this disease. Knowing we were raising money to help others going through the same thing was such a rewarding experience and I wouldn’t trade the small amount of work the race took for the impact it had on me. You can read my past race director recaps here (2014 and 2015) but taking something you love doing (running and racing) and then paring it with an awesome cause and a giving community is by far the most humbling experience you can go through. Have you ever organized a race? What tips do you have for someone organizing a race? Be sure to go see what Courtney, Cynthia, Mar and the others are up to over at the Friday Five Link up! That is awesome. I’ve never done it, but it sounds challenging but rewarding. The sort of thing that would be fun to help with.